Most of our guests sign up for one of our fitness retreats to experience new workouts, get motivated and inspired and challenge themselves in a way they haven’t before. Tabata is a particularly challenging interval format and can be used in many different ways. It can be used for cardio, weights, core – you name it. It’s a form of HIIT (high intensity interval training). Like HIIT, Tabata exhausts the body and produces an “after burn” which means your body will burn calories at a higher rate for a longer period of time after your workout. To put it simply, your metabolism will be elevated slightly for minutes to hours after your workout – a HUGE win!! We incorporate low impact tabata workouts at our fitness retreat to give guests a workout that doesn’t involve jarring and pounding and it also teaches people how to tax themselves without having to add in running, jump squats, etc. Plus, many of our guests have joint issues of some type so we like to make sure there are safe yet effective options for everyone. If you’re not familiar with Tabata, it is a type of HIIT interval format. One tabata is comprised of eight rounds of intense exercises in a specific 20-seconds-on, 10-seconds-off interval (for a total of 4 minutes). Example: Tabata training is usually done with only one movement. This way, you perform one movement (like push ups) for four minutes at a high intensity level so you should feel like absolute toast after that four minute time period. If you don’t feel taxed – you didn’t work hard enough! Tabata training was born after Japanese scientist Izumi Tabata and his colleagues compared the results of moderate intensity training and HIIT. The study evaluated two groups of speed-skating athletes. The first group trained on ergonomic cycles at moderate intensity for one hour, five days per week, for a total of six weeks. The second group completed four-minute, high-intensity workouts on ergonomic cycles four days per week for a total of six weeks. The second group completed its four minutes of work by doing eight intervals of all-out training, and then resting 10 seconds. The scientists’ results concluded that the athletes who performed high-intensity training saw increases in aerobic and anaerobic system capacities; whereas the moderate-intensity group did not improve anaerobic performance. The Tabata training method was formed by modeling workouts after the second group. Below is one of the workouts we have actually done at our fitness retreat. We switch things up all of the time but this one is a fantastic, workout that focuses a little more on chest, shoulders and triceps as well as legs. It has zero impact but challenges you in a big way! Warm Up: We always suggest a warm up of about 5 minutes (give or take a few depending on you and your body). Appropriate warm ups are walking, jogging, dynamic flexibility or foam rolling. We suggest no static stretching before you’re warm. 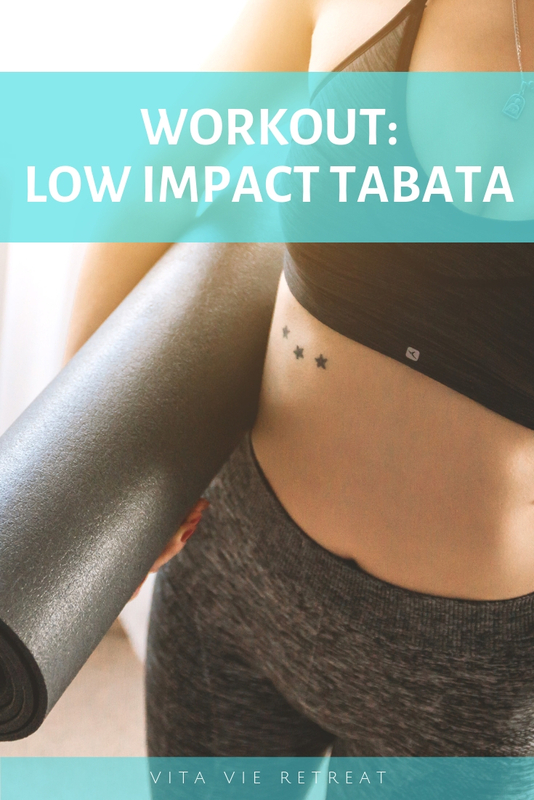 Now you probably get the idea of what a tabata is if you haven’t done one before… We won’t post the format for the rest of the tabatas – just the exercises but they need to be performed exactly as above with the exercise named. Warm Down: A warm down of about 5 minutes is always suggested. You can warm down the same way you warmed up or add in static stretching at this point. Foam rolling and/or dynamic flexility are also great ways to cool down. Join us for a fitness retreat to jumpstart your healthy habits and get workout motivation and inspiration! We offer both group and private packages – Vita Boot Camp or our Private Fitness Retreats. We also offer Health and Wellness Coaching online or for local clients in the Delray Beach area. I hope you enjoyed this workout! If you have questions, type them below in the comment section and I’ll be happy to answer them for you. P.S. Keep in touch with us by signing up for our email newsletter (scroll to the bottom of the page to get updates)!